Five or six years ago, I emailed Kevin DeYoung to see if he would be willing to speak at our conference the following October, which was then about 18 months away. I had just read Why We're Not Emergent, and though the book was doing well, Kevin hadn't really hit the conference circuit yet. Kevin responded personally and was enthusiastic about the idea. He seemed surprised that we were planning things that far in advance. He encouraged me to contact him again when we had more details. About six months later, I contacted him again. Unfortunately, during these six months the demands on his schedule had greatly increased. This time, I did not get a personal response. I got a response from his secretary, who informed me that his schedule would not allow him to participate. I've often kicked myself for not staying on top of the email communication with Kevin. But I understood and assumed that he was probably way busier than he would like to be. My suspicions about Kevin's ministry being quite busy seem to be true. He's just published an excellent book entitled Crazy Busy. I highly recommend it to those who are struggling with the demands of a hectic life (i.e., everyone). His advice is sound, biblical, and cuts to the root issues in the hearts of those who struggle with being "too busy." There are lots great insights in the book, but let me just give one sample from a chapter entitled, "A Cruel Kindergarchy." In the chapter, DeYoung suggests that one reason we're too busy is because of our child-centered lifestyles. We're "freaking out" about our kids, assuming that if we don't create an idyllic environment for them, they'll flounder in life. How we parent matters less than we think when it comes to the sort of person our kids will become in twenty years but it still matters a great deal in determining what our kids' present experience will be and how they will remember their childhood twenty years from now. We may not be able to shape our child's future identity as much as we'd like, but we can profoundly shape their experience of childhood in the present. That's why one of the best things we can do for our kids is to find a way to stop being so frantic and frazzled. There's lots of good stuff in here. Pride, misplaced priorities, the lure of modern technology, and the refusal to rest are all topics that are covered well by DeYoung as he considers how "crazy busy" we are. Oh, and I almost forgot the best part: the book is really short. I read it during my daughter's gymnastic's class while occasionally answering email while my wife was taking our boys to a parade and our other daughter to her cross country meet. I'm looking forward to our baptismal service on October 6! 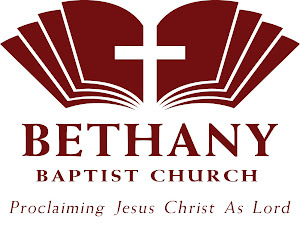 If you'd like to participate, please contact the church at 309-508-1755 or info@bethanycommunitychurch.org. Many believers rightly understand that baptism doesn't "save" you. Baptism doesn't bring about the restoration of your relationship with God. What many believers fail to understand is that baptism is still extremely important and intricately connected to our salvation experience. Baptism proclaims the story of my salvation. If you haven't been baptized and are wondering about the significance of baptism, let me encourage you to check out this message from John Piper on the meaning and importance of baptism. Some of you may have seen these two wordlets already, but I wanted to put them side-by-side in one place. I know wordlets have been around for awhile but I had never done one until last week. I feel kinda like a person saying, "Hey, everyone! Look at this cool thing called 'email'!" The first image is a graphic representation of the words that occurred most frequently in my sermon manuscripts. 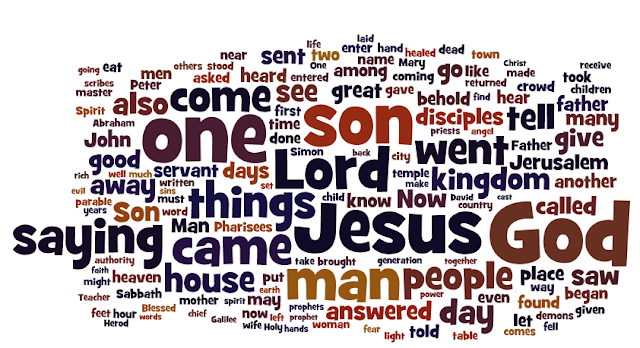 And here is a wordlet with a graphic representation of the words that occur most frequently in the text of Luke. First, some of the differences between the two wordlets are the function of one being a sermon and the other being a narrative text. I'm not going to use the word "saying" a lot in the sermon, whereas Luke will use the term frequently. Second, the similarities on the big issues are encouraging. Jesus, God, Lord, kingdom dominate both wordlets. 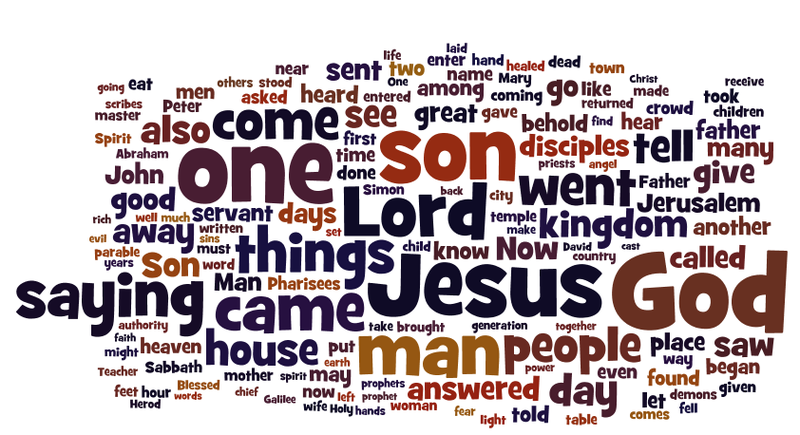 Third, it seems the mid-sized words are most important in the sermon wordlet in understanding the themes of the sermon. The kingdom, love, sin, repentance are dominant themes in Luke and the wordlet shows that. 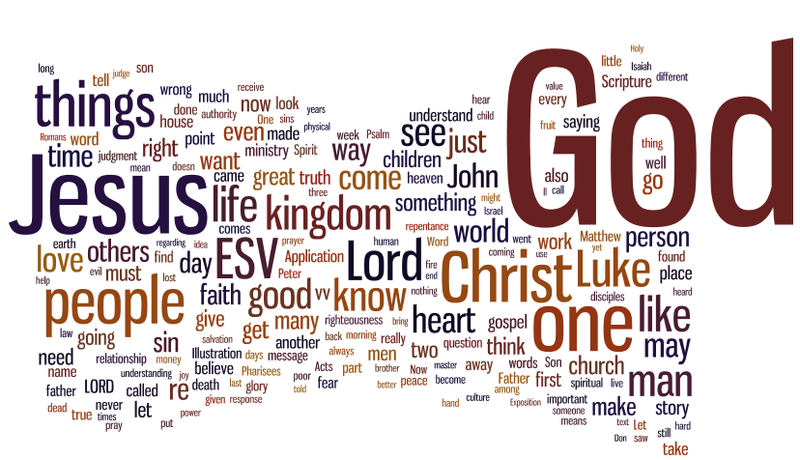 Finally, I was encouraged by some of the words that weren't in the sermon wordlet. Illustrations are helpful and I try to use them in sermons. But the main things my sermon manuscripts are focused on is the text. I think there's a good balance. Looking forward to Sunday and our new series: The Promise of the Gospel! Many of our high school graduates have begun classes at a college or trade school or begun their journey directly into the marketplace. What an exciting time of life! I recently wrote a letter to these high school graduates that I share with you now in hopes that you may pass it on to a young adult for their encouragement. Please pray diligently for the young men and women that God has included in your life. The battle against the devil, the world and the flesh is strong. Thank God that He is stronger yet! Congratulations on your graduation from high school! I rejoice with you in your past accomplishments and pray for your future. I pray for God to be very real and very wonderful to you. It is through knowing Him that we find sense in the disorder of this world, joy in the brokenness, and direction in the chaos. You have some great decisions ahead of you as you seek to carve out a life. You will have more freedom than you have ever had and more opportunity for doing both good and evil. May God give you wisdom to know which path leads to life and grace to choose to walk on that path. Some of you are about to begin college life, while others have already entered the marketplace. I am praying for you as you seek to advance God’s reputation in a world that does not know how great He is. This world is full of paths and you will have to choose from the myriad of options in front of you. Many of those paths will look lush, fun and pleasing. 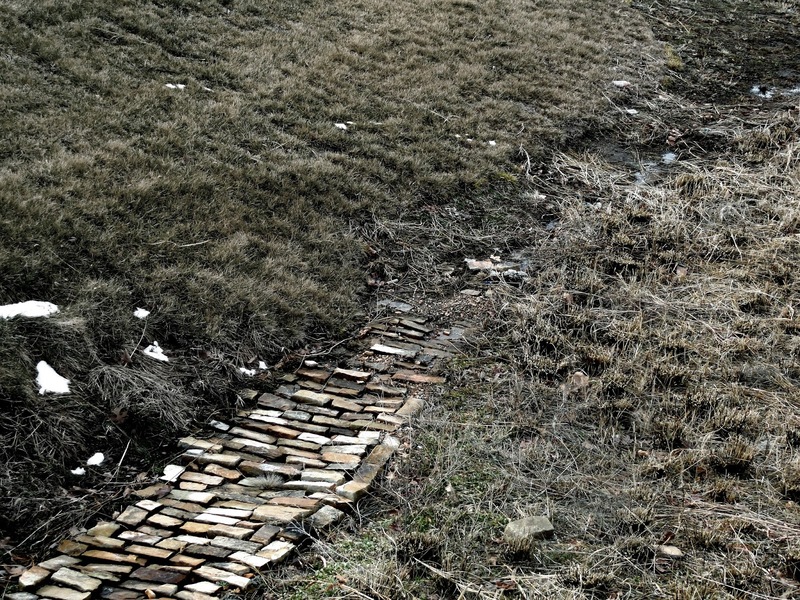 God’s counsel is to ask for the “ancient paths.” This counsel contradicts with your nature. Your fleshly nature will be drawn to the paths that are new, exciting, pleasant or attractive in appearance. The key element of a path is not its surface, its landscape or its views, but the key element of a path is where it leads you. God reminds us of four key truths in this passage from Jeremiah. 1. God calls you to ask for the ancient paths. You will not find the ancient paths unless you ask for them and seek after them. The world around you hides them from your sight. Only those who seek God’s paths will find them. Only those who ask for God’s ways will be given such wisdom. So begin each day asking for the ancient paths. God will direct you! Know that God’s map to these ancient paths is His Word and God’s guide is the Holy Spirit. God reveals in His Word that the path is really a Person: God’s own Son. He will be found by those who seek after Him. So as you ask for the ancient paths, search the Scriptures and depend upon God’s Spirit to give you light and look for Jesus. 2. God describes the ancient path. God describes the ancient paths as “where the good way is.” Jesus will never lead you into harmful ends. The devil knows that, but he is crafty. He does not want you to desire the ancient paths and so he does two things. First, he masks the goodness of the ancient paths so as to make them despised and rejected. He will tempt you to question whether God’s paths really do lead to life. Second, he decorates the new paths so as to make them loved and embraced. He will tempt you to think that other paths are wonderful and wise. Please remember how God describes the ancient paths! Those who say the ancient paths are not good profess to be wiser than God. 3. God commands you to walk on the ancient path. Of course, it is not enough to know about the ancient paths or even to agree with them. Paths only lead to life if we walk in them. Obedience to God is key to everything. God does not call you to walk alone. He is with you. He has also given you His church so that you walk with others on this path. I urge you to commit your lives to a local church and walk on God’s ancient paths with others of faith. You will need the body of Christ to obey God’s command to faithfully walk on the ancient paths. 4. God promises that you will find rest on the ancient path. There is no rest like soul rest. A rest that quiets your heart when life gets hard. And life will be hard. You will endure trials and difficulties of all kinds. God only knows the difficulties that await you. This truth need not bring worry or anxiety. God promises rest for our souls as we walk the ancient paths. What a sweet gift soul rest is! This gift is yours as you walk the ancient paths! Listen to Jesus’ promise in Matthew 11:28-29: Come to me, all who labor and are heavy laden, and I will give you rest. Take my yoke upon you, and learn from me, for I am gentle and lowly in heart, and you will find rest for your souls. Remember God loves you. Please send me your prayer requests as you have needs. My email is ritch@bethanycentral.org. I want to pray for you. My heart is always open to you to talk or pray together. About once a week someone comes up to apologize for something that happened during the worship service. Let me offer two words of encouragement for you disrupters of the service in general. First, I probably didn’t notice whatever it is for which you are apologizing. I'm pretty busy up there. Second, if I did notice, I almost definitely didn’t know it was you. Let me also say this as a word of encouragement for the parents of young ones in our congregation: I'm grateful for crying babies! We are so glad you are here! When I hear the sounds of babies in the worship service, I thank God that He has blessed our church with so many little ones. The sounds of young voices expressing their displeasure, while certainly occasionally distracting, encourage our church by revealing that there is life in this place. Imagine what a church with no children would sound like. Imagine the still silence of a lifeless church. I’m not advocating that you pinch your children to help them announce their presence. And I definitely think it is wise for parents to remove screaming children from the worship service until they calm down (the children, that is). I also think it is often helpful for parents to use our nursery ministry for children when it is convenient for their family. What I’m trying to communicate to our church and to you who are parents is simply to rejoice that God has given our church life! The corporate worship service is not some well-choreographed musical number. It’s a time when we as a family get together to worship and talk about God. We rejoice in the presence of our youngest members!